Processing is possible consistently. You can also specify the design of the original design and addition of post processing (such as water repellent processing). By adopting the direct printing method, short delivery time and low cost are realized. But we have equipments that can consistently handle in-house operations from scouring to shipment of processed goods. Small lot production is possible at low cost because perforation is unnecessary. Printing to nylon material which is difficult to print compared with polyester material is also possible. Using 8 colors, 16 heads, we achieved full-color printing capable of color expression of 16.7 million colors. In addition, since high resolution printing of 540 × 360 to 540 × 720 dpi is possible, it is possible to reproduce a smooth gradation which was impossible in the version. 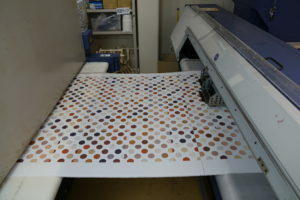 It is possible to add various functions such as water repellent processing and chlorine odor processing after printing as well as inkjet printing. In order to prevent data troubles, we ask you to submit the data according to this entry condition.